Salmon is the second most-popular fish eaten in the United States. It tastes savory and earthy, yet slightly sweet, and is among the richest sources of omega-3 fatty acids. It is also full of high-quality protein, vitamins and minerals. Nelson Trout & Salmon Farm in Eastman, Wisconsin, raises Atlantic salmon in spring-fed outdoor raceways, similar to how rainbow trout are raised. It is the only source of farm-raised Atlantic salmon in the Midwest. Other Atlantic salmon farms in Maine, Washington, and in countries like Norway, Scotland and Chile, raise their fish in net pens—submerged cages in the ocean or fresh bodies of water. The University of Wisconsin-Stevens Point Northern Aquaculture Demonstration Facility is contributing to research on raising Atlantic salmon using indoor recirculating aquaculture systems. 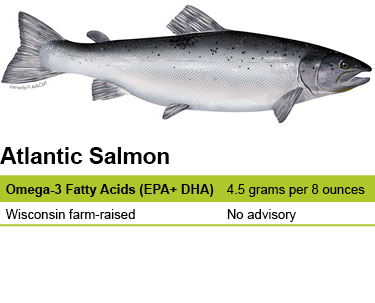 There is no consumption advisory for Wisconsin farm-raised Atlantic salmon. All salmon are anadramous—that is, they live part of their lives in fresh water, and can also live part of their lives in salt water. While Pacific salmon usually die after returning to spawn in the streams where they hatched, Atlantic salmon do not, and can return to the sea. In colonial times, Atlantic salmon were found in almost every river north of the Hudson River. Dams, pollution and overfishing severely depleted their populations, and today, Atlantic salmon are extinct in roughly 80 percent of the rivers in New England where they once lived. Because wild stocks are so depleted, there is no U.S. commercial fishing for Atlantic salmon. Atlantic salmon have been raised in hatcheries since 1864.